Aqua Pools Online > About > Blog > Plan for Summer Now! With freezing temperatures outside and snow in the forecast, installing an in-ground swimming pool is probably the furthest thing from your mind, but now is actually the ideal time to start planning your pool. 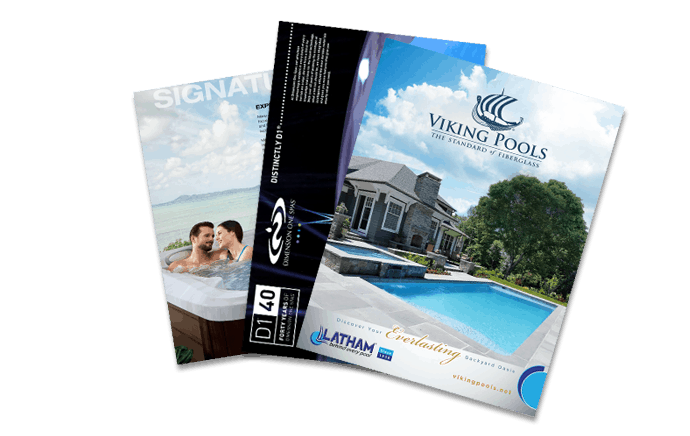 As soon as those first signs of life begin to emerge this spring people will be flooding to their local pool stores to begin planning their pools. Glorious dreams of summer fun dancing in their head, unfortunately the calendar is only so big, and many of those who wait until the last minute, will spend more of their summer with pool installation than they will throwing pool parties. There are several steps to installing an in-ground pool. Many of those steps can be done even when the weather is not cooperating. For starters, you will need to meet with the pool company to decide on many important features, size, location, and type of pool. Not to mention, planning all of the design elements, landscaping and decking that will go around the pool. Once all of the planning is done, you will need to get required permits and approvals. After these things are in place, you are just waiting for those workable days to start the actual pool construction. By planning ahead those days will come well before the weather gets warm enough to actually swim. Your pool is sure to be up and running in plenty of time for you to get the maximum use out of it this summer. Don’t be one of those people who only has half the summer with their new pool; get to the front of the line, so all of the planning and installation is done before those hot summer days hit. You will be glad that you can spend the entire summer partying poolside. Since 1974, we’ve been helping families decide what is the best option for their next backyard project. When you are ready to schedule your pool installation, our Aqua Family is here to help your family!